Swedish indie game studio Mojang behind the “Still in Beta” PC game success story Minecraft hit 1 Million in sales last week. Over 10 000 games being sold daily for €14.95 ($20) each, with every third registered user converted into buying customer, 55% of them from the US, are sales figures that has made VCs’ heads spin. Or how about a Minecraft tribute made by fans and fellow startup friends at Spotify. And then we haven’t even started to talk about all the creative stuff that’s been sent to the team by its fans. Hint: I’d look awesome in those t-shirts if only they were more of a becoming size. Fred Wilson of Union Square Ventures, and recent investor in SoundCloud, shared great advice on what to do when your startup gets hot and VC’s start throwing money at you, summarized in: Money is distraction if you don’t need it. Stay focused on the product and mission. For your own good, go read Fred’s entire advice. Mojang has now grown up to a team of seven, Markus also having recruited his former colleague Carl Manneh as the company CEO. Both Markus and Carl used to share workspace at Jalbum, Swedish startup with neat online web photo albums and high quality photo books. When VCs start calling you, instead of the other way around, you’re probably doing something good. Congrats! Thus, I thought it would be valuable for fellow entrepreneurs to have Carl share his best advice when getting caught in the eye of the tornado. Thanks Carl! The smart investors know that, and they are now helping out by giving advice and introducing Mojang to people in their network. The first result of that is soon to be announced Mojang advisory board including both world-class entrepreneurs and investors. 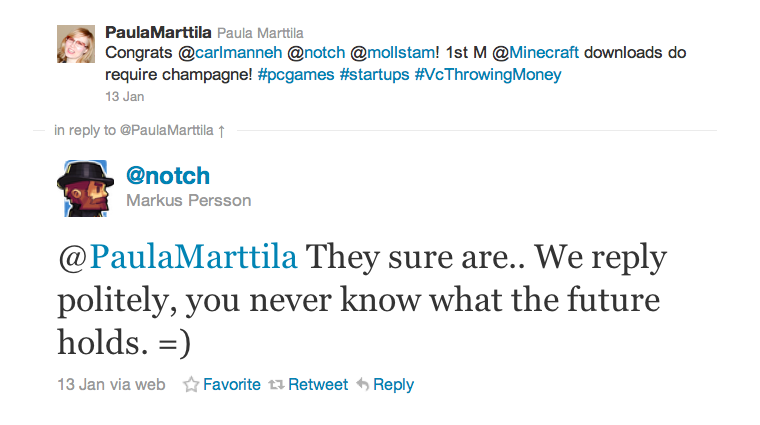 For Mojang, it’s heads down and keep building. It’s not interested in scaling up fast or aiming for an exit, that would simply not support its vision: Build great games and attract a global audience with a small, agile team of brilliant people that moves quicker than the wind. Besides from Twitter, you can keep your eye on how Minecraft is coming along on the developer blog The Word of Notch and catch up with the team adventures and new games being developed on the Minecraft’s Dev Diary at PC Gamer. Would you be in San Francisco in February, you’ll have a chance to meet the entire team at Game Developers Choice Awards (GDCA) and Independent Games Festival (IGF). 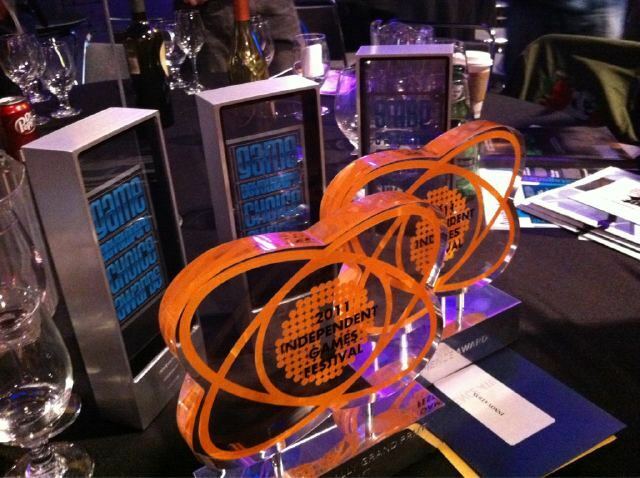 Minecraft has received three nominations at each awards, making it the first game ever to be both nominated for GDCA and IGF finalist in the same year. Minecraft is also nominated at Folkets Val 2011, Go give your vote! Good luck guys, keep playing! 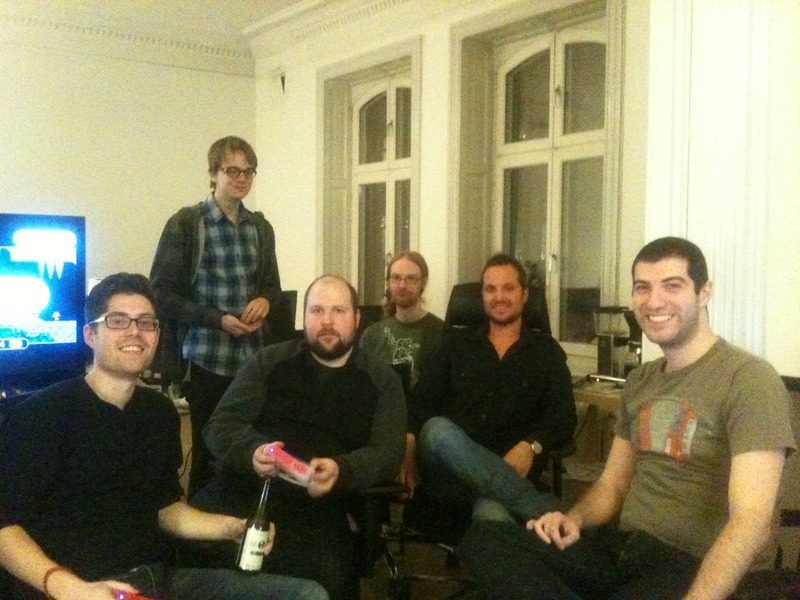 Great gaming Friday at Mojang HQ. Interview with Markus Persson in Swedish: Mångmiljonär på gör det själv-spel.